Join the coolest cat in all the land on his latest escapade. Click here to play! There is a whole stack of cash just waiting for you on his adventures, so hop to it and start partying with the rich cat himself. Fat Cat is an exciting 5-reel slot that is played across 9 unique pay lines, with the more lines activated meaning you have more chances to pick up winning combos. The Fat Cat is Wild and can therefore become any other symbol, except Scatters, in order to complete combinations. Dollar Signs are Scattered and can show up anywhere on the reels in order to earn a payout. And don’t forget about the lucrative Bonus Round, either! 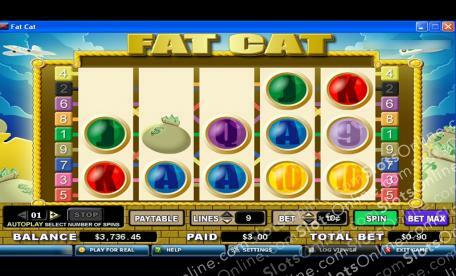 Fat Cat is a non-stop thrill ride of a slot machine, so get on down and start playing for your chance to win today! The Dollar Sign is Scattered and can therefore show up anywhere on the reels. Spinning up two or more anywhere will always earn you a payout. The Fat Cat is Wild and can be subbed for any other symbol, except Scatters, in order to finish off winning combos. Spin up the correct symbols in the right sequence to activate the lucrative Bonus Round!